I have other ways to get pictures to my clients. For example, I was shooting a whole bunch of corporate head-shots at a conference recently and the client wanted them straight away for various social media and powerpoint uses. We needed to work out the best method for both of us and their AV people mentioned that a shared Dropbox folder would suit their needs best. Working backwards from there I decided to use my Canon EOS6D camera which has some built in wireless networking and set it up to send medium resolution Jpegs to one of my laptops sitting in the conference centre. That’s easy enough to do using Canon’s own EOS Utility software. 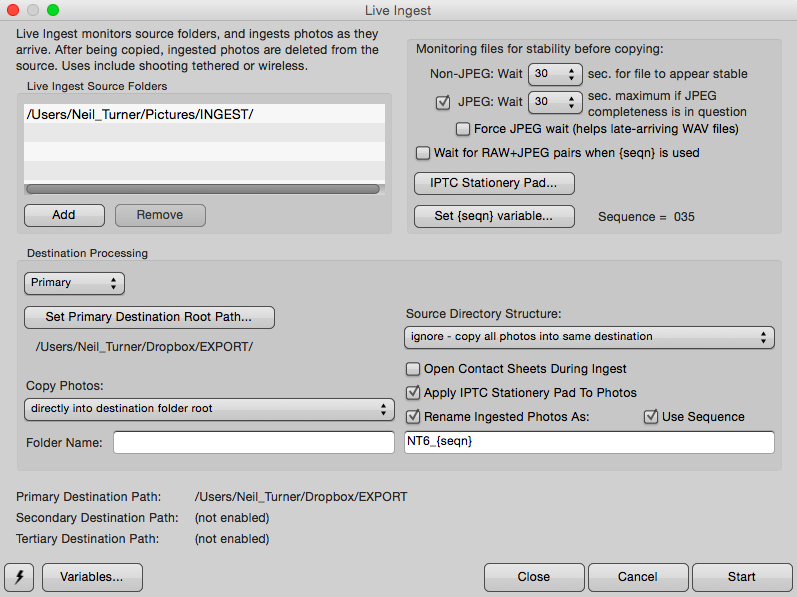 I had Photo Mechanic running on the laptop with a “Live Ingest” watching the folder where the Jpegs were arriving. The ingest added a basic caption and my details as well as the accurate time before copying the files to pre-shared Dropbox folders where the client, their social media team and the audio visual technicians could do what they needed to do with them. Somebody else was then re-naming the files with the subject’s name and everyone was very happy. That’s one solution but it wouldn’t necessarily work for other clients. Another recent case needed a different idea. I needed to supply very rapid pictures to the client’s FTP address from the camera. This made captioning much harder and between us we agreed that for social media use they only needed relatively small files and that speed was more important than anything else. Later in the day I would have time to process and properly caption the RAW files and so I set up the 5D MkIII to shoot RAW to the CF card and medium compressed Jpegs to the SD card. Whilst the Eye-Fi ProX2 can send pictures over FTP I went with Canon’s own wifi transmitter the WFT-E7 for several reasons, not the least of which is that it gives you proper feedback when the file has been transferred. I also made sure that the playback on the camera screen was set to card 2 (the SD card) which makes selection and sending from the camera a lot easier. On this occasion I used my own 4G Mifi unit to do all of the transfers as I was in an area with brilliant 4G signals and there wasn’t much network congestion as everyone else in the place seemed to be using the free wifi. It takes about five minutes using the built-in wizard in the camera to set up a new connection and we tested the system ahead of the event. The idea was simple – every time there was a lull in the event, I would quickly scroll back through the recent pictures and use the ‘set’ button on the camera to transmit the chosen Jpegs to the client’s server and into a pre-designated folder on the server. If it became too busy to make selections I could simply switch to sending every single file. The system worked pretty much flawlessly all day and the battery on the WFT-E7 was still at 66% after five hours use. I did not have to resort to sending everything – much to everyone’s great relief! Other professional cameras have their own dedicated wifi transmitters but some of them kill the camera’s own batteries. That is definitely the case with the EOS6D – battery drain is huge and you need to make sure that you have plenty of spares with you. Over the last couple of years I have worked with half a dozen different cameras and their accompanying transmitters – from Nikon, Canon and Fujifilm – as well as trying most of the aftermarket options from SD cards to the rather impressive Camranger. I really like the Canon WFT-E7 even if it is a bit cumbersome when attached to the bottom of the camera and so I tend to use it on a longish cable with the unit on my belt or in a pocket. There’s one other technique that I use from time to time and it is probably the most reliable of all and that is to connect the camera to the laptop and share the pictures that way. When there is a choice between a bit of cable or a wireless connection I will always use the bit of cable because it is less prone to interference. It means that it becomes harder to move around but a cable from the camera into a laptop running with the lid closed inside a small rucksack is sometimes the way to go. Getting an Apple laptop to keep working with the lid closed requires some third party software and I’ve found InsomniaX to be very good for this specific job. The laptop battery takes a bit of a hit but it is otherwise a reliable way to go. This isn’t a particularly elegant solution but it is one of the many solutions that I have at my disposal. Having many ways to achieve similar goals means that I can satisfy a range of clients by tailoring my service to their needs. Some days I don’t need to supply pictures quickly but those days appear to be getting fewer and further between. There’s so much more to this whole topic than I have space for here such as being able to verify which files have arrived safely and having the ability to back up remotely as you work. The worst part is that I am starting to find this whole topic interesting or even satisfying which, according to the opening paragraph makes me someone not in their right mind! Really interesting article Neil, especially the nod to InsomniaX. I haven’t used it myself but have heard others talking about it. Its not everyones cup of tea but I like to use Lightroom when I want to automate stuff. I use the Watch Folders plugin by Jeffry Friedl. Its really good as it allows you to add all the metadata and captioning information you need as well as any automated processing you want to do then it will publish the files to various services if you need to. Recently I was working a Corporate Event where the client wanted me to publish the images live to a web gallery, have them play live on a large screen and also be sent to a printer so the guests could take them home. I set Lightroom, using the plugin, to watch a folder. The images were processed using a preset, which included adding metadata and a watermark. The images were sent to the publishing service. A copy was sent to external hard drive which was being watched by another laptop running LR and the plugin. This displayed the images live on the big screen in another room. The same folder, on the external drive, was being watched by another laptop running the plugin where an operator handled on-site sales to the printer. It all sounds complicated but it was actually very simple and worked very well without any problems. I’ll have a look at the plug-in that you mention. So far every attempt that I’ve made to get to grips with Lightroom has ended with disappointment. I guess that it is about time for another go! My pleasure. Speed is a huge issue for a lot of clients these days.